Every cook, no matter what their experience level, needs to have a good set of knives in the kitchen. There are always ingredients to be cut, chopped or sliced. With the growing popularity of cooking shows, more people are beginning to experiment with new recipes at home. Rachel Ray has become one of the most popular cooking personalities on television and millions of fans tune in to get cooking directions from the perky host. It's only logical, then, that Ms. Ray would lend her name to a line of cookware and cutlery. At first glance, the Rachael Ray Furi FUR868 Gusto-Grip 8-Piece Birchwood Knife Block Set sets itself apart from many other kitchen knife sets. 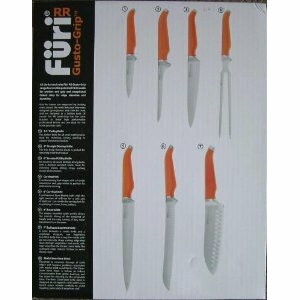 Produced by a company called Füritechnics, this set of kitchen knives features cute orange handles. Since Rachel's favorite color is orange, this comes as no surprise to fans of her television shows and cook books. The orange handles are more than just decorative, though, they are extremely tacked out to provide a secure, no-slip grip. Since cutting accidents commonly occur because of grip problems, it's clear that this set aims to improve kitchen safety right from the start. Don't let the cute day-glow orange handles fool you, though, these knives are sharp and built to last too. Each knife is made from the best German CrMoV stainless steel alloy. This metal alloy is built to be strong and resilient enough to stand up to even the toughest cutting or chopping jobs. The knives are perfectly balanced for superior cutting and comfortable use. When combined with the super grip handles, these lightweight, but extremely sharp knives are easy to use and built to last for years to come. There's even an anti-microbial agent infused into the handles to help fight the battle against contamination in the kitchen. Any time you're considering buying a product with a celebrity's name on it, you have to be curious about how good the product really is. 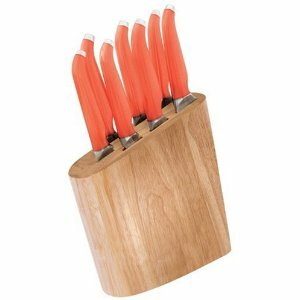 This same concern applies to the Rachael Ray Furi FUR868 Gusto-Grip 8-Piece Birchwood Knife Block Set. While researching this set, we were curious what customers, who have used the set, really think about these knives. We were pleasantly surprised to find that this is a product that actually stands up to scrutiny and works well for people in their own kitchens. Customers have responded in an overwhelmingly positive manner to this fun, cute set of kitchen knives. One customer even said that it is the best set of knives he owns, and others have raved about the quality of the entire set. The set is made especially for fans of Rachel Ray, but the knives are of a high enough quality that any cook can appreciate and use them on a regular basis. Amazon offers to ship this 8 piece set free with super saver shipping. We also found that very few online stores carry this exact knife set. Even Racael Ray's website did not offer it. So if the 8-piece set is the one you want your best bet would be to purchase it from Amazon. When checking prices we found that Amazon offers the 10-Piece Knife Set which is the same as the 8-piece plus you get the 8-inch cook's knife and poultry shears. For less money than the 8 piece set.